Diamond Claddagh ring is cast in white gold and features princess cut diamonds in the heart along with additional rows of accent stones. This 14K white gold Claddagh ring features a diamond heart that is comprised of 8 princess cut diamonds with a 0.50ct. weight. This white gold Claddagh ring also boasts 18 diamonds in the band for an additional 0.25ct diamond weight; the total weight is 0.75ct. (3/4 carat total diamond weight). The white gold Claddagh ring measures 1/2" tall in the front and the diamonds have a clarity grade of SI 1 with a G - H color rating. Diamond Claddagh ring is cast in 14K gold and features 3/4 carat total diamond weight. 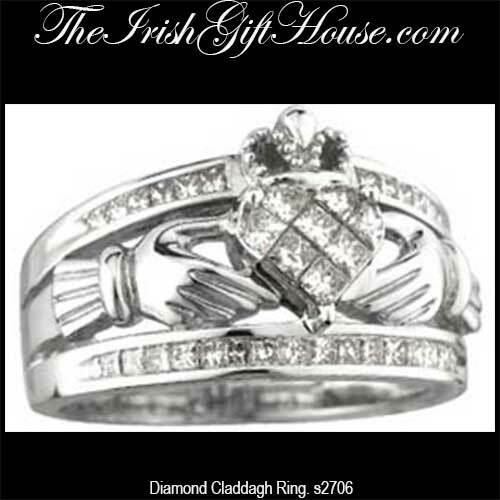 White gold Claddagh ring features 3 rows of diamonds.